Hundreds of runners of all ages, cheered on by families and friends, took part today in a 5km run to raise funds for charities. 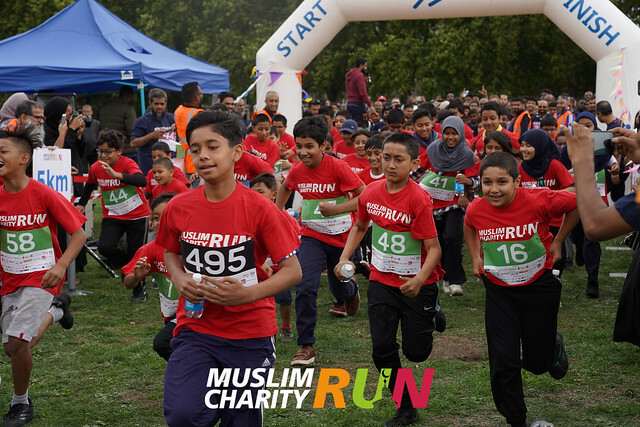 This was the seventh year of this annual event, organised by the East London Mosque, which combines fitness and fun to support a variety of good causes. Congregating in Tower Hamlet's Victoria Park, over 450 runners lined up at the start line, spurred on their way by inspiring words of encouragement from Mosque Chairman, Habibur Rahman. First to complete the course was Dame Dibaba, aged 28. Winners in each of the age groups were presented with trophies, and every competitor received a beautiful medal made especially for the occasion. Mayor of Tower Hamlets, John Biggs, and Deputy Mayor, Sirajul Islam, joined the Imam of the East London Mosque, Shaykh Abdul Qayum, and other Mosque and community leaders, to congratulate the winners and all those taking part. There were several bouncy castles to keep the children entertained, and a health advice stall for adults. Human Aid UK, Muslim Charity, Muslim Aid, Syria Relief, Human Appeal, Diamond Jewels, The Society of British Bangladeshi Solicitors, Muslim Hands, Eden Care, Human Relief Foundation, Muntada Aid, Islamic Relief, Penny Appeal, Ice Hot Merchandise, Bamfords Trust Ltd, Muslim Giving. Media Partners: Channel S, Eman Channel, Iqra Bangla, TV One. East London Mosque Trust, Helping Humanity, HHUGS, Muslim Hands, Bangladesh Regeneration Trust, One Nation, Human Appeal, Islamic Relief, Lonely Orphans, London East Academy & Al Mizan School, Human Aid UK, Hafs Academy, Newbury Park Mosque, Syria Relief, Muntada Aid, Global Aid Trust, Greenwich Islamic Centre, Physician Across Continents, Essex Cultural & Youth Society, Lewisham Islamic Centre, Orphans In Need, Jamiatul Ummah, Eden Care/Sylhet Aid, Muslim Research & Development Foundation, Sporting Foundation, and Human Care Initiative.